Merovingian. Patrician Nemafidius, ca. AD 700 to 710. Silver denier. Denomination : Silver denier. Mint : Marseille. Size : 9.7 x 10.8 mm. Weight : 1.20 grams. (this is a small coin). Date : ca. AD 700 to 710. Grade : VF for one of these, but slightly off-centre. These are always crude. Obverse : Human head left, with an X by the chin. Reverse : A small cross with NEF (the NE are ligate) above (short for Nemafidius). Only about half of the monogram is visible. 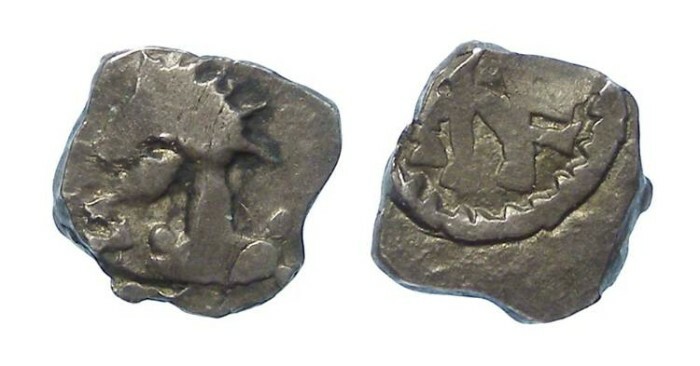 These are very small, crude coins, but the are the cheapest of the Merovingian coinage.